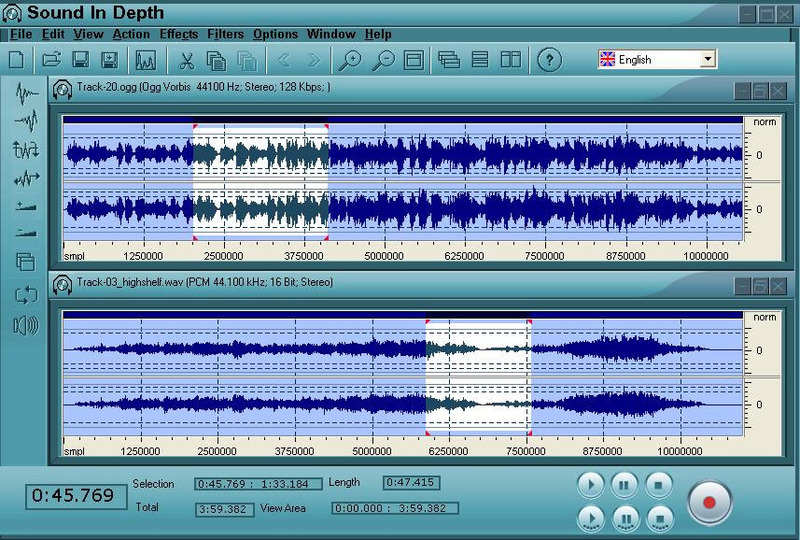 Sound In Depth is a powerful and easy-to-use audio editing and Converting program with multi-language support.Manage and edit your sound files. Perform various operations such as cut, copy, and paste features, mix tracks, or apply effects to your recordings. Built-in amplitude-envelope editor, a customizable spectrogram mode, & a frequency-analysis window for audio-analysis applications, batch open/edit most audio formats and much more. ...... MPC, PCM, GSM and more. * Save audio files to the following formats: MP3, WAV, VOX, OGG, G726, WMA, and RAW, Also Features the ability to edit ID3 Tags of the following file types: WAV, MP3, WMA, and OGG. * Record from all available audio sources in your system like microphone, stereo mix, line in and more. The Ability to Mix audio files or insert/append recorded audio into the current file and save the output. Also offers various editing features and a wide range of filters and effects and much more. * Mix audio files or insert recorded audio into the current file and save the output. * Offers various editing features. * A wide range of filters and effects. * View Frequency Analysis for your audio files. Convert your DRM protected music files into MP3 / WAV / AAC formats. 13x speed. Relax to sounds and visuals with this sound therapy software. Batch convert your text files to wav and other audio files. Extract audio sound from video files to MP3, WAV, WMA or OGG format. Qweas is providing links to Sound InDepth 1.2.0.0 as a courtesy, and makes no representations regarding Sound InDepth or any other applications or any information related thereto. Any questions, complaints or claims regarding this application Sound InDepth 1.2.0.0 must be directed to the appropriate software vendor. You may click the publisher link of Sound InDepth on the top of this page to get more details about the vendor.